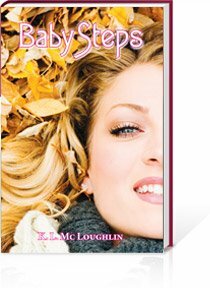 Baby Steps is the story of one women starting over with a second chance at love and happiness. Lynda Blake is a widow with a teenage son struggling to find room for herself in her own life. From the very beginning I knew she deserved to be happy, I knew I was going to find a way for her to have it all, a happy ending that was really a happy beginning. Lynda is a character I know well. In many ways she and I think alike. I was determined to give her a life I didn’t think I’d ever have. When I created her, I had two small children, one in pre-school, one in kindergarten and was hanging on in an unhappy marriage. I’d made my bed and for the sake of kids I was laying in it. But Lynda was free and she had her chance, I was going to make darn sure that she made the most of it. As you can see, my first real experience with the power of intention and affirmations came about inadvertently by writing this novel. Now, I’m not the fastest of writers. From start to submission I spent four and a half years writing and rewriting my novel. I learned about Lynda’s love interest Dr. Michael Cameron early on in the process. He was tall, dark hair, strong, had the look of a solid man but most importantly he was a man who was honest with himself about who he was good and bad. He was a man who not only knew how to love but didn’t need Lynda to be anybody other than who she was. By the end of my third draft of Baby Steps, three years later, I had been separated from my soon to be ex-husband for the better part of a year and the divorce was all but signed. I’d dedicated myself to learning all I could about myself so that I would not dare make the same mistakes again. If I was going to get a second chance at love I was going to make all new mistakes this time! I wanted to learn about myself and grow so that I would be ready for love. I woke up every day happy and appreciated that more than I can express. I was lonely but it was so much easier to be lonely and alone than lonely and in a relationship. I wasn’t sure I’d ever really trust a man enough to be willing to bring him into my children’s life when I met my very own Michael. He is strong and solid. He has black hair. He is honest with himself and knows how to love better than I do. He has an EQ off the charts. For some reason this amazing man fell in love with me and my kids. We became a family and married 11 months later. I had no idea when I began writing Baby Steps that I was opening the door to my own new happy beginning but if Lynda deserved to be happy then I did too. So even if you can’t see your way out of where you are write it for someone else, someone kind of like you and see what happens. You just might create your own new beginning too! K.L. 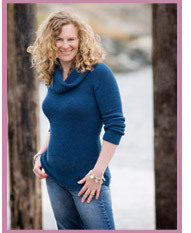 Mc Loughlin is the author of Baby Steps and host of PIVTR's Today's Women. For more information please visit her website www.klmcloughlin.com or www.internetvoicesradio.com. What a lovely story about life imitating art. Writing really can open doors, not only in our lives, but in our hearts as well. Thank you for sharing your story. You give a sense of hope to many. Thank you. Can your BlackBerry Help Your Writing Career? "When the onus falls on you"